How To Get Clickfunnels For Free! Get A Free Trial Of The Industry-Leading Software, Clickfunnels! Thinking of signing up to the Clickfunnels free trial? It’s the most incredible opportunity! So, you’ve heard about this platform that automates your entire sales process bringing in leads even as you sleep? Too good to be true? Well, now you can find out for yourself. Click funnels is offering new members a free trial meaning you can try before you buy. Not impressed? No worries. You can leave, without paying a penny. Although the tool does have a number of Clickfunnels pricing packages which are definitely worth your money! We’d recommend doing some research first, though. It’s tempting to jump into the free trial without any prior planning to get a taste of that automated income. After all, it’s free. Why not, right? You have zero knowledge of the platform, so be prepared to spend the entire trial getting to know how everything works. Big mistake. 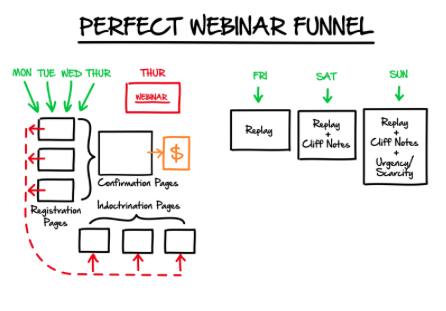 Pro Tip 1: Map Out Your Funnel, Including Your Offer! You don’t have to be inside the platform to know how it operates. On signing up to the free trial, you will receive 6 free pre-made funnel templates to get you started. These are the landing pages your customers will land on to find out more about your business. Clickfunnels also allows you to include email responders to communicate with your potential customers. In other words, you can automate the entire marketing process and send customers in directions based on their actions. It’s important to understand the capabilities of Clickfunnels before you set about planning your offer sequence. You should have a clear idea in your mind as to what your offer sequence will look like before signing up to the Clickfunnels free trial. Simply, get scribbling on a piece of paper your ideas. 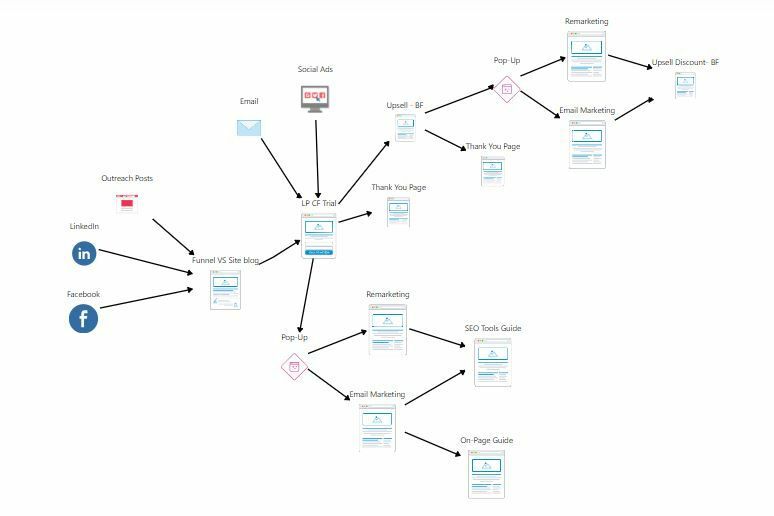 Alternatively, if you’d prefer a more refined process, use Funnelytics to map out your offering. You don’t want to go in right away with a sale. Your customers will run a mile! Typically, your customers have to see your brand mentioned seven times, or more, before making a purchase. Offer them lots of value before selling them a product/ service. Therefore, they will trust your brand and associate you with professionalism. This comes back to wasting time during your Clickfunnels free trial. Ideally, you want to have all your content ready to go before you hit ‘sign up.’ If you have your funnels all planned out, then it will be straightforward to insert your content. Set aside an hour every morning to sculpt out your sales message, including any images, headings, text and videos you need to bring your funnel to life. It sounds excessive, but if you want to make this work without having to pay a fee for the software, this is essential. Not a professional content writer? Don’t know how to write persuasive content that really hits the emotional triggers/pain points of your customers? Not a problem. 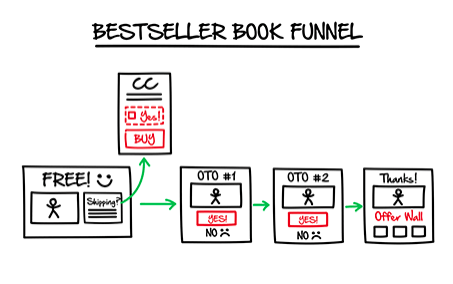 Clickfunnels offers potential customers an eBook that gives them the outline to proven sales messages. Don’t have the cash to splash? Give our content team a call on 01226 720 755, and they’ll give you some top tips, totally free. This generally means having a strategy in place to generate leads before signing up to the Clickfunnels free trial. There are countless ways to generate interest in your brand, but because we’ve found it the most effective, we’re going to be talking about Facebook ads. Design your ad using an eye-catching image and/or video, set your targeting, enter your sales message, and you’re ready to go. What speeds up this entire process is the fact you can use the exact same message as is on your landing page (see above). Your content is sculpted out in such a way as to appeal to the desires of your customers. Using the same message will ensure you maintain customer expectations from the first contact right through to conversion. This is all about getting your material in place, so you don’t waste trial time once you have signed up. Once you sign up to the Clickfunnels free trial, you are given access to the Clickfunnels affiliate programme so you can start making money from promoting the software. 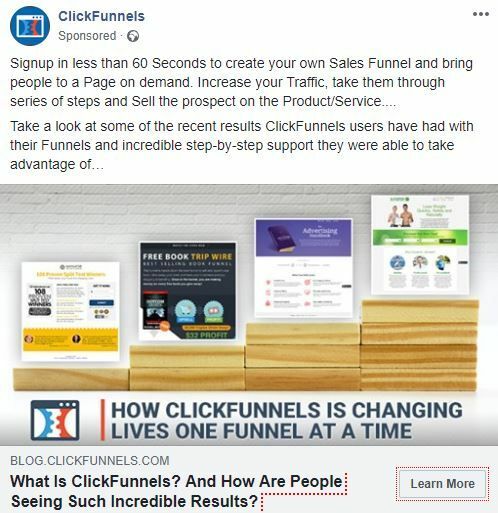 And yes, we are proud Clickfunnels affiliates and are using affiliate links in this post (so that we both financially benefit from this incredible programme). The great thing about promoting Clickfunnels is that the funnels are pre-made for you to ensure you get the best possible results. All the resources designed to sell the platform are there, including promotional videos, graphics, content and funnel scripts. In other words, the brilliance of the software will pretty much do the job of selling for you. So, while you are waiting for the results to roll in from your companies funnel, you would be a fool not to take advantage of the 40% commission promised from promoting Clickfunnels. Keep in mind that once you set up these funnels the income is automated. 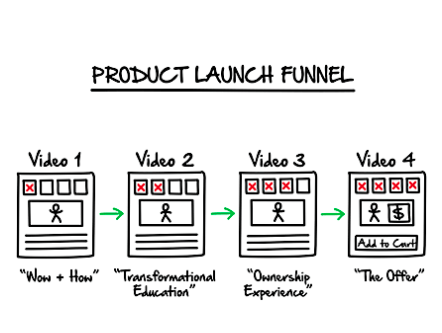 You have put in the hard work designing your funnels. Now, all you have to do is sit back and watch as the money comes flowing in. We have pretty much one of the largest funnel marketing knowledge hubs in existence. We have done our research, tested Clickfunnels, and know what works and what most certainly does not. Give our pages a read and educate yourself before diving into setting up your funnels and making money through funnel marketing! Ready for the Clickfunnels free trial? If you’ve followed our pro tips and feel you’re ready to get started, then sign up for the Clickfunnels 14 Day Free Trial. Once inside, you will have access to lots of training and resources to help you along the way. Remember, don’t fall into the trap of getting lost in everything available. Stick to your offer sequence, create your funnels, start sending traffic to them and you’ll be a success!